House Bolton character only. Setup. Response: After you win a challenge in which attached character participated, kneel Bloody Scourge to choose and discard 1 kneeling character from play. 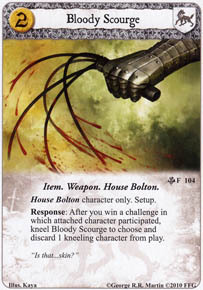 Most house bolton cards have no attachment except weapon; in a bolton deck this card finds a place easily.